Solid Capture Screen Capture and Image Sharing Toolkit. Capture and collaborate with ease! O Solid Capture is the ultimate screen capture and image sharing toolkit. Easily capture anything on your screen using our simple interface or a hotkey. You can also easily edit, format, and share your captures. Capture and collaborate with ease! Solid Capture: Screen Capture and Image Sharing ToolkitSolid Capture version 3 contains everything you need to capture and collaborate with ease!CAPTURE ANYTHING ON YOUR SCREEN. Using our intuitive interface or a keyboard shortcut, you can capture full screens on multiple monitors, windows (fixed or scrolling), or just selected screen areas. Our unique Rectangle Frame also lets you specify dimensions and save multiple captures of an identical size.EDIT, FORMAT, SHARE. Version 3 provides many ways to edit, format, and share your captures. Solid Capture saves images in your favorite graphics file format, including BMP, JPG, TIF, GIF, or PNG, which you can open in your favorite graphics program. You can preview multiple captures, add captions, and create a new PDF from your captures.CAPTURE COLORS AND TEXT. Screen colors can be captured in the color value of your choice (including HTML, .NET, or RGB) or as a color swatch. 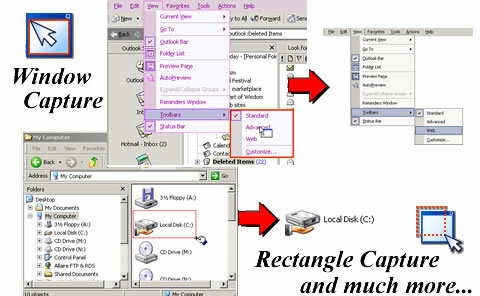 Microsoft� Office users can even extract text from screen captures to use in Word or any other text editor!AND MORE Drag-and-drop images to and from Solid Capture, magnify a screen area up to 800%, use our Window Ruler to measure dimensions horizontally and vertically, and use our screen resizing to visualize screens in different resolutions. The Solid Capture toolkit provides all the essentials for working with on-screen images.Solid Capture is perfect for technical writers, Web designers, or any professional who needs to capture screens and graphics to integrate into documentation, presentations, or training tools. It is designed to work with any graphics editing program, such as Adobe� Photoshop� or Paint Shop Pro�. See above information and user's reviews about Solid Capture Screen Capture and Image Sharing Toolkit. Capture and collaborate with ease!